We already see more than once about how to fix different problems that prevent us from connecting to the Internet and therefore access any Web content through our browser. This problem is quite common and usually happens even if your internet connection is good. This tells us that the problem isn’t your internet but somewhat your computer or OS that prevents us from connecting to the internet. 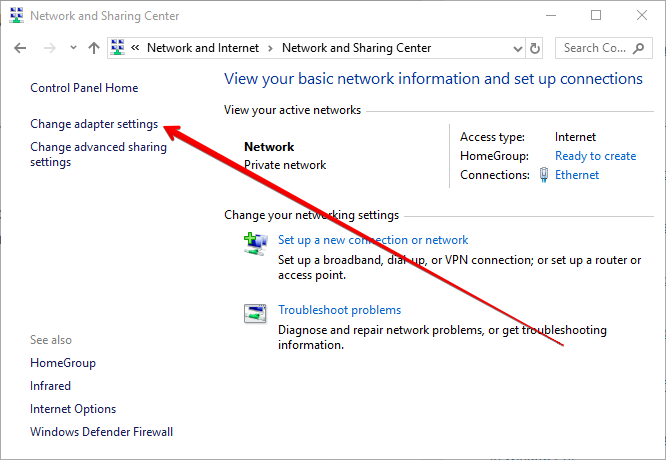 However even knowing that the error occurs in the computer, the possible causes thereof are numerous and can range from wrong settings of your computer to a problem with DNS servers. Even though the chance that the web is inactive is meager and, instead of other more common messages such as HTTP 503 error, a check must be made. In principle, there are two options to check web status. Through the classic way, that is, try to access other pages from the browser. The fact that these pages don’t show the ERR_CONNECTION_REFUSED is a clear indication that the problem is on the server side of the webpage. Is another way to use web tools such as Down For Everyone Or Just Me? Where you enter the URL of the page and you will get a quick check of the general status of the page. Restarting the router is one of the most repetitive answers when trying to fix various problems, although the probability that it is a valid fix is quite low. Even so, you must rule out that the “This Site Cant Be Reached” error is due to a failure in the router, more if the check just takes a few minutes. To do this, simply disconnect the device from the power energy and wait about 30 seconds to plug it back in. When the router is on, try to access the web page with the error and, if the message persists, there is another reason for this error. 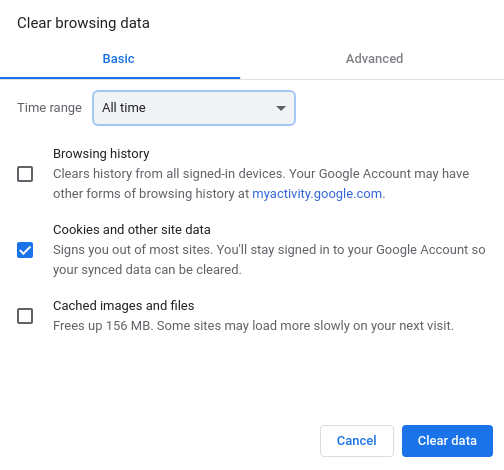 Like all Internet browsers, Chrome also stores a large amount of information in the cache: history, cookies, static content such as images or access data, etc. All this allows to load the pages already visited more quickly. This can be a problem if the cache is not up to date and, therefore, doesn’t match the current version of the page that you want to access. One of the ways to fix the This Site Cant Be Reached error is emptying the Google browser cache. One of the issues that most worries users and providers of browsers is the protection of privacy on the World Wide Web. In fact, in the development of web browsers, security features have become increasingly important. Despite this, many users also resort to individual solutions to protect their data. Especially noteworthy is the use of proxy servers, which work as intermediaries between the web and the browser, filtering the communication and storing the data and hiding the IP addresses of users to the web servers. There are different scenarios in which a proxy server can cause a This site can be reached error when trying to connect a page: for example, the web server could block the proxy or its IP address and, as a consequence, deny the connection. Another possible reason for the error is in the cache feature because if it contains obsolete data, the error message will continue to appear. Of course, there is also the possibility that the proxy isn’t enabled or is incorrectly configured, in which case the connection would also fail. Now, click on Show advanced settings. 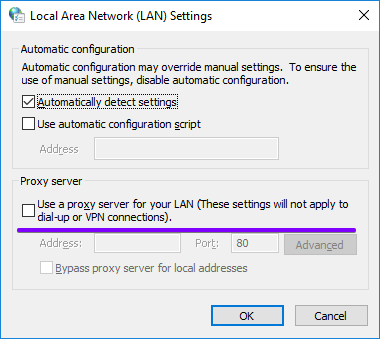 In the System section, you will find the option Open proxy settings. Click on OK and try to reaccess the webpage, if that doesn’t fix your problem, try another method. Firewalls, antiviruses and other malicious software also serve to protect the user and the system, filtering the network traffic and scanning the system at regular intervals to automatically block harmful or potentially unsafe pages, as well as detecting malicious software. Although this software is very important to ensure security, it is also problematic when it prevents connection to a page by blocking it by mistake. A solution to the problem caused by this type of software is to disable the firewall or antivirus temporarily. If when you disable your antivirus, and you can access the webpage, you already know what is the cause and you can make the changes in the antivirus or firewall. While most Internet users are aware of the existence of the browser cache, only a few know that the operating system also stores information about browsing behavior. In this way, the DNS cache receives temporary entries of all the pages that have been accessed with a browser; entries that contain all the necessary information for the resolution of names of the domain addresses. 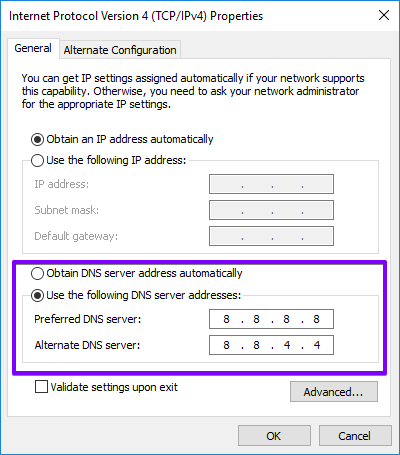 That is, the DNS cache performs a task similar to the browser cache, eliminating the need to contact the DNS server again, which saves a lot of time. But it’s not always good for the DNS cache to respond directly to the request because if an entry doesn’t correspond to the most current version of a website, it is possible that technical problems and connection errors may arise. The easiest solution is to clear the cache, which can be carried out without further complication with the Command Prompt in Windows. Name resolution is one of the essential components to guarantee the functionality of computer networks. DNS servers can be responsible for certain connection errors when it doesn’t work as it should, either due to an overload, or because it is disconnected. In most cases, the DNS server address is obtained automatically from the Internet access provider, although you can use your name servers. Extensions allow to extend the functionality of Chrome. However, most of these extensions aren’t from Google but have been developed by third parties, and when the user decides to use them, it has no guarantee that they will work as expected or will be updated over time to remain compatible, for example, with the new versions of Chrome. Well, there are extensions not updated or with errors that can trigger error connections. So, disabling some of your extensions can be the solution. If you can connect to the page in question after disabling all the extensions, at least you have proof that one of them is the cause. To discover which one is responsible, you have to enable one by one, and once you have found it, you have to delete it by clicking on Remove. Although the user can change the DNS server itself and, it can’t do anything regarding the packet filters that the provider performs. Since there is a possibility that this may block the connection to the page through the firewall, its recommended to contact the technical support service if the user hasn’t been able to fix the problem on its own. With luck, the page in question is blocked and it is enough to ask for the unlock to correct the This Site Cant Be Reached Error.